European research shows that from every dollar spent on energy, about 8 cents are lost because of substandard insulation of piping or equipment. Optimized insulation can reduce the energy bill considerably, not only in industry but also in the commercial building sector. It is difficult to comprehend that companies invest in heat recovery from smoke gases, or improvement of the burner settings, with a multiple year pay-out, but do not reduce heat loss in the first place by optimizing insulation systems. The payback of good insulation systems more often takes just months instead of years, making insulation improvements the fastest return on investment of energy-efficiency measures. Throughout history, our ability to live in harmony with our environment has depended on the availability of energy. In this regard, civilizations can be seen as thermodynamic systems that grow in proportion to their energy access and decline when they become unable to sustain productivity and quality of life from available energy. Energy is a key driver of social and economic development. A world without energy is inconceivable and would be incapable of development, sustainable or otherwise. structure that is producing diminishing returns at ever greater economic, environmental, and security costs. The Kyoto protocol objectives and, more recently, the constraints on energy supply have increased the attention given to energy-efficiency policies. The main long-term drivers of energy-efficiency policies are security of energy supply; efficiency of national economies; environmental concerns, including global warming; and, in developing countries, investment constraints on the energy supply side. The enormous potential of energy-efficiency improvements at all stages of energy production and use is widely recognized, but realizing this potential remains a global challenge. 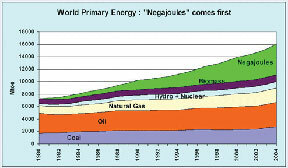 Remarkably, as of 2004, improving energy efficiency has become the largest single source of energy worldwide (see Figure 1, in which negajoules equals negative joules-i.e., the energy we did not spend). Insulation plays a pivotal role in this improvement. The global power sector is facing a number of issues, but the most fundamental challenge is meeting the rapidly growing demand for energy services in a sustainable way, at an affordable cost, and in an environmentally acceptable manner. This challenge is further compounded by the fact that the major part of the future increase in demand for power (and, hence, in emissions) will come from developing countries, striving for rapid economic development. Energy projects are among the most capital-intensive infrastructure investments. Decisions made today will affect lives for decades, and it is important that these decisions are based on facts and a proper economic assessment of available options. This is where insulation should come into focus. 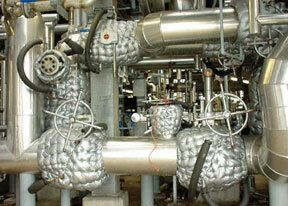 A power facility cannot be run without insulation. But reality often shows a different picture, in which non-optimized insulation is acceptable to management. One often does not realize that, following the International Organization for Standardization (ISO) 12241 standard (Thermal Insulation for Building Equipment and Industrial Installations-Calculation Rules), a high-temperature, non-insulated valve represents about 70 feet of non-insulated pipe with the same diameter. 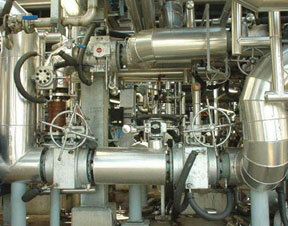 This massive loss is too often camouflaged by unjust process reasons for not insulating valves and flanges. It is essential to realize that an optimized system gives the best returns in efficiency and money. Increasing competition in the electricity sector has had significant implications for plant operation. It requires thinking in strategic and economic-rather than purely technical-terms. This is not always easy for the plant operator community, which is heavily dominated by engineers with a technical mindset. New drivers geared toward profitability, cost control, environmental stewardship, and market economics are shifting the focus away from traditional measures of technical excellence, such as availability, reliability, and forced outage rate. There are enough energy resources around the world to satisfy demand over the next 40+ years. The primary challenge will be how to get these resources and energy services to the places that have the greatest need for them. The second challenge is that fossil fuels will continue to account for the largest proportion of primary energy requirements through the next 4 decades. Not only must world energy supplies be doubled-and access improved-but greenhouse gas emissions must be effectively managed and climate change addressed. Higher energy prices will propel the developed world toward greater energy efficiency and attract much higher levels of capital investment in infrastructure. In light of ever-increasing prices and environmental toll, it is hard to understand the current mindset of minimizing as much insulation. The “assessment for the need of insulation” approach is, of course, valid, but a recommendation to minimize insulation is not one to support. Now, consider a real industrial case history. A 15-year-old industrial installation with process temperatures between 140°F and 600°F was originally insulated with a thickness of 60 mm to 80 mm, which was correct at the time of installation. Based on current energy prices, however, the economic insulation thickness should be 140 mm, creating a gap between real and desired thickness that represents an energy loss of about $1 million a year and an additional 4 million metric tons of carbon dioxide (CO2) emissions! Taking into account that energy prices will remain high, it is highly recommended that the insulation thickness be adjusted, starting with larger repairs and new projects on site. Savings from insulating a simple valve usually will not impress facility owners much, but estimating the energy loss due to non-optimized insulation for a small, 300,000 barrel-per-day refinery in the Netherlands shows an entirely different picture. Based on the European average for non-optimized insulation (or no insulation at all) in industrial installations of 5 to 10 percent (compared to U.S. figures at 20 to 25 percent! ), this refinery loses the equivalent of around 4,500 barrels a day, representing a current value around $180 million per year. The insulation optimization in this case is estimated at only around $20 million. This refinery also unnecessarily emits 500,000 metric tons of CO2 per year. Extrapolated for the industry in Europe, these figures become even more dramatic. Every day, the equivalent of around 150,000 barrels of oil are lost because industrial installations do not have up-to-date insulation, yet we only talk, set up commissions, try to make international agreements, and make a trade out of our CO2. Is it not our responsibility to save energy by not spending it in the first place, delivering a significant contribution to a sustainable future? Or, as the French poet Moliere (1650) once said: “Nous sommes non seulement responsable pour ce que nous faisons, mais aussi pour ce que nous ne faisons pas” (“It is not only what we do, but also what we do not do, for which we are accountable.”). Sidebar: Commercial building case study A system for cooling ceilings was designed for 59°F (in) to 63°F (return). With an ambient temperature of 75°F, the return line remains firmly under this temperature. Because the building designer (and investment company) wanted to keep the investment as low as possible, it was decided not to insulate these return lines to save $95,000. Was this a wise decision? In this case, the subject is about 30,000 feet of NB48 piping, to be insulated with 20 mm to 25 mm PIR/Mylarfoil. Based on operating hours per year, temperatures, and insulation, the proposed system saved $45,000 per year on the energy bill. In other words: Leaving out the one-time investment of $95,000 would cost the user of this building $45,000 every year. This calculation was made not taking into account that energy prices are rising rapidly. The investment had a payout of less than 2 years. Insulating this system also meant saving 150 metric tons of CO2 emissions per year. In this project, based on these hard figures, it was decided to insulate the return lines afterward.